Six pundits have submitted their predictions for the opening night of the 2019 Unibet Premier League in Newcastle. Six famous faces will battle it out to be the top predictor at the conclusion of the league phase, as the Premier League stars compete over 16 nights to make it to The O2 for the Play-Offs on May 23. 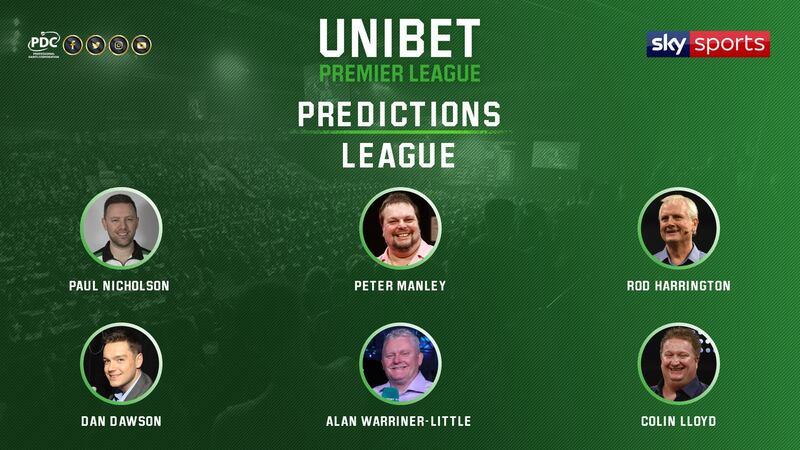 The Predictions League features former Premier League stars Peter Manley and Colin Lloyd, PDC Hall of Fame Member Rod Harrington, 2001 World Grand Prix champion Alan Warriner-Little, 2010 Players Championship Finals winner Paul Nicholson and darts broadcaster Dan Dawson. The competition will conclude following the final group phase matches in Leeds on May 16, with the winner to be presented with the inaugural Unibet Premier League Predictions League Trophy at The O2. Darts' widest-reaching tournament will see 17 nights of action held from February-May, broadcast live on Sky Sports and worldwide through the PDC's broadcast partners, and through PDCTV-HD for Rest of the World Subscribers.